TMA 402 F1/F3 Hyperion® - Thermomechanical analyzer. 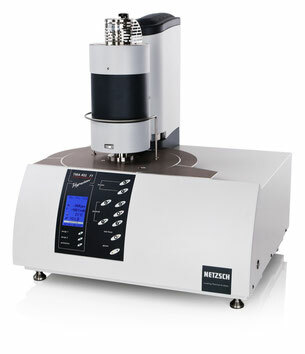 Thermomechanical Analyzer - Vertical Dilatometer. The entire TMA 402 Hyperion® measuring system is thermally stabilized via water-cooling. This ensures that the measurement will not be influenced by heat from the furnace or by temperature fluctuations in the local environment. All joints have a vacuum-tight design to allow measurements in a highly pure atmosphere or under vacuum. Pressures of less than 10-4 mbar can be achieved in the TMA 402 F1/F3 Hyperion® with the use of a turbo molecular pump. In combination with the integrated mass flow controllers (MFC) for purge and protective gases (optional in the TMA 402 F3 Hyperion®), measurements in highly pure inert gas or in oxidizing atmospheres can be optimally controlled. Simultaneous measurement of force and displacement signal.